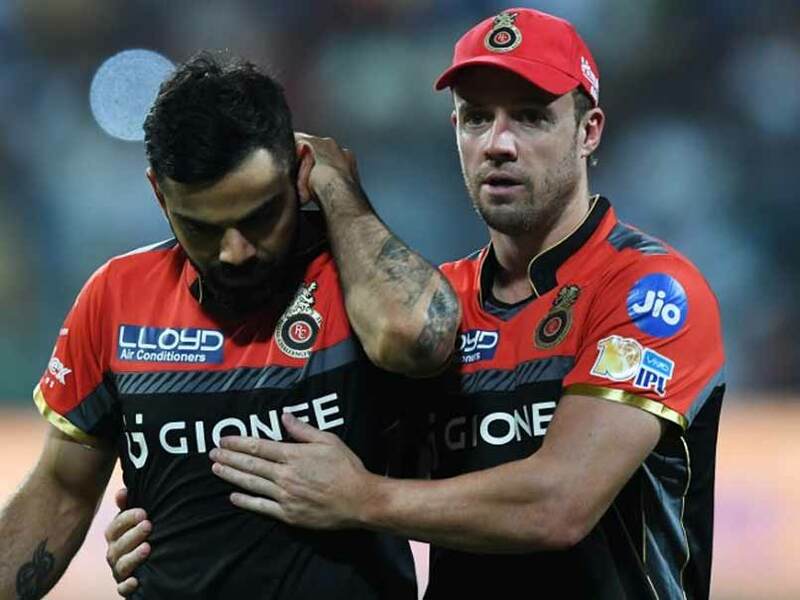 Royal Challengers Bangalore skipper Virat Kohli on Thursday said the same two-three players can't win games for the team matches every time. Kohli added that his side needed to play positive cricket to emerge out of their losing streak after they suffered yet another loss in the Indian Premier League in Bengaluru. RCB endured another crushing defeat, this time at the hands of the Suresh Raina's Gujarat Lions, who notched up a seven-wicket win with 6.1 overs to spare to revive their IPL play-off hopes. One of the guy who always escapes the whiplash is SAravind. Can't believe they never found his replacement. Then pick the right squad and team Mr Kohli, who will all contribute towards the win. The finger pointing continues from VK. Man up VK, yeah others have not been playing well. But you are earning the most bread in the bunch. And you've done nothing this season. Leadership is about more than talking tough. Walk the line VK. He is right, RCB are too dependent on these three players. Doesn't matter if he's right or not. Even if he was playing well, he shouldn't be calling out his team like this. Why Mandeep ,Binny, Arvind always are in the playing 11. He is not calling anyone out.He gave credit to other team also. Barring Kohli they have worst set of Indian players with KL Rahul and Sarfraz not available. Disagree there is Chahal,Jadhav and surprisingly Negi has done very well this season too. Warner, Bhuvi in SRH, Gambhir, Uthappa in KKR, MCCullum, Raina in GL, etc. Also it is the top order in all IPL teams which scores, so if your top order who are your big 2 or 3 fails then automatically everything falls apart. And even Gambhir is not doing the right thing. You will learn when you are in positions of leadership - if you want to get the best out of people, its much higher probability of success if you don't humiliate them, especially publicly. In the rare cases where someone or a team needs to get fired up and you feel like an earful dose needs to be delivered - you do it but privately. And keep it private. You don't talk about it until a long time has passed. Talking tough like this might sound good, but it doesn't build confidence in your group, nor does it really strengthen trust and positivity towards the leader - these intangibles are important commodities and you don't just throw it all away just to look or sound good in a press conference. You have to make the most of what you have. Gambhir is not exactly blessed with world class players. He put together a side that covers all the bases and make sure they deliver. Even Dhoni for the large part had to deal with substandard local players. Kohli has issues with winning matches with ordinary players. Many teams have done that. Deccan chargers, Rajasthan Royals, CSK. Rcb are playing T20 cricket old way .Fact is they have to learn T20 is a bowlers game.You need bowling to win.Kkr has great bowling strength so does Mumbai,Sunrisers.With Rcb bowling batsman are always under pressure to score 20 runs above par. The squad in itself was picked in such a way that batting was lot more stronger than the bowling. Now few batters are out of form and they are struggling even more. Good bowling nearly always trumps good batting. Reason is simple, i.e. a good bowler will be in the game for his full quota no matter what but a good batsman can get out early and not make a difference. The best example would be Warne's team that lifted the cup. His team was full of nobody at that time and still was able to lift the trophy because of his captaincy skills and bringing out the best in his local players. Kohli has a couple of world class players (if you ask me, the top 3 t20 batsmen plays for his team) but is unable to extract that winning formula from his local players. RCB selectors are also to be blamed here, selecting a team full of batsmen instead of proper bowlers.